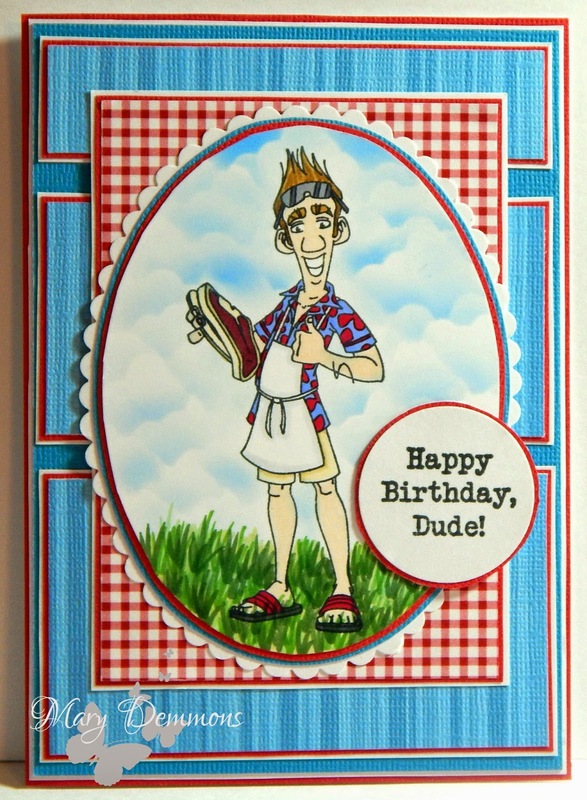 Mary's Crafting Corner: Happy Birthday Dude! Hi everyone! 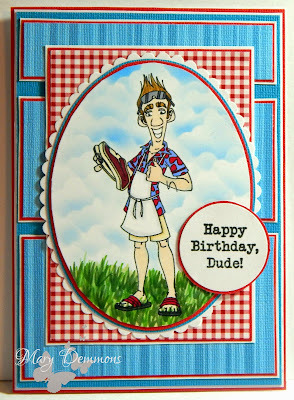 I made this birthday card using this great new image from Kraftin' Kimmie Stamps. It is part of the Wild And Crazy Guys stamp set. I colored this image using Spectrum Noir pens. This was my first time attempting to do a sky background on my image. I used the cloud template from Netty's Cards and a light blue ink pad along with makeup sponges to create the sky. This was also my first attempt at adding grass. I followed the grass tutorial by Melanie Holtz found here. I used the sketch from Sketchy Colors. I layered card stock and patterned papers to finish the front of my card. The sentiment I used is also from the Wild And Crazy Guys stamp set. Love the dude, so funny image. Great Colored, love the way you have colored the clouds. Thank you for participating in Sketchy Colors, good luck. Outstanding card! Your coloring is awesome and I love the cloudy sky. So glad you shared your creation at Cardz 4 Guyz. A fabulously fun card and a brilliant image. CD Sunday Challenge #8 - our 9th Birthday - theme - 'Birthdays' - using a CD somewhere. Our Challenge Blog Has Moved! Craft Hoarders Anonymous Monthly Blog Hop! Shop the Retirement Sale Then Hop into Easter Weekend with Inspiration from Keisha! "Team A" with "Lacy Sunshine"
Puttin' By With A BIrthday Hi!